If it is your job to organise and plan the perfect hen party then you have come to the right place. We know that you want something different which is fun, interactive and memorable so we take the stress out of organising your cocktail making class. Why book your cocktail class through us? Well no need to feel the pressure of making sure that all the friends (and of course the bride to be) has a great time. You’ve found the perfect place to organise it and give you hen party ideas to make the event go smoothly. We know that the best celebrations usually start right here. With a cocktail making hen party you will be on the right track to make your night out fantastic. Enquire online or call 0330 660 0521. At My Cocktail Masterclass, we’ve had years of experience getting all the best packages, venues and of course prices together to make booking up as simple as possible. This will leave you to enjoy the build up to the celebration. We know that whether you all dress up, or just embarrass the bachelorette with something frightfully hilarious to wear, it’s the friends and people that make it a great event. But how could it be complete without cocktails? Every hen party should have cocktails included as part of a great night out. However drinking cocktails is just part of the fun. Learning how to make your favourite cocktails can be just as much fun as drinking them. Some of you may be looking for an afternoon tea, type party, well we’ve got that too (though the tea is usually replaced with something a little stronger). Just ask about our teapot cocktail masterclass and you’ll love it. So whether you want to start the cocktail making celebrations early around lunchtime, or relax with a spa day then get more rowdy at night, we’ve got cocktail lessons to suit. Starting from early afternoon all the way through to 8pm in some areas. If you are looking for hen party ideas, you have come to the right place. Gather your girls together and prepare for a night to remember as we’ll get you mixing the night away in a fun and interactive cocktail making class. 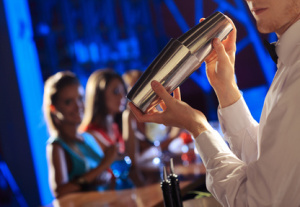 Put on your glad rags and dress up for a party to remember, as you’re welcomed by your personal bartender who will show you all the tricks of the trade.